What I love about making my own granola is that I can customize it to include whatever dried fruits and nuts I have on hand (or am in the mood for). Best of all, it costs a fraction of what I'd pay if I bought a good-quality granola at the store. If you have stores in your area that offer dried fruits and nuts in bulk bins, that's the route to go! Grab what you want in small quantities ... it'll save you from buying big bags of nuts or dried fruit that may not get used before they go bad. Also, it'll save on money ... a handful of nuts or dried fruit from the bulk section can be just a dollar or less. Besides the oats, my granola is usually studded with coconut, nuts and whatever dried fruit we have in the pantry. The mixture is seasoned with warm spices like, cinnamon and nutmeg. And, my wet ingredients include honey, maple syrup, vanilla and orange juice. I love the addition of the O.J. It yields a slight hint of citrus to the granola and just a touch of extra sweetness. 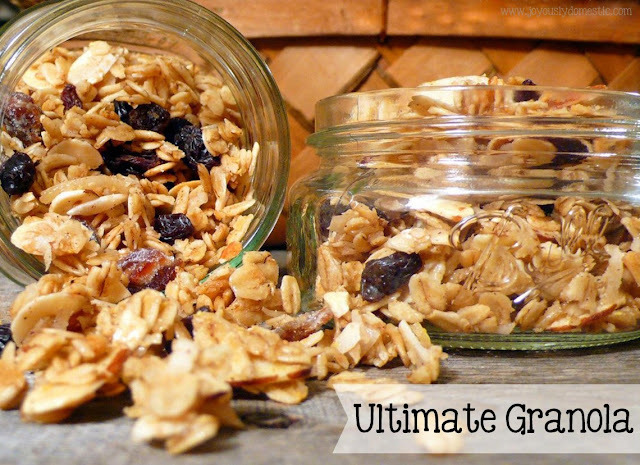 This granola recipe produces the perfect combination of both crunchy and chewy textures in regards to the oats. I hate when granola is so hard and crunchy that it almost breaks my teeth. This granola rocks with the perfect amount of chewiness mixed in with some crunch. It's just as easy to double or triple the recipe ... granola will keep in an airtight container for, at least, a couple of weeks. It's divine over yogurt, with milk as a cereal (drizzled with a bit more honey) or just to snack on! Preheat oven to 300 degrees. Line a large sheet pan with parchment paper. Lightly coat with cooking spray. Set aside. In a large mixing bowl, combine the oats, nuts, salt, coconut, nutmeg and cinnamon. Set aside. In a medium saucepan set to medium-low heat, bring butter, honey, syrup, orange juice and brown sugar to a slight boil. As soon as the brown sugar is fully dissolved, remove pan from heat and stir in vanilla. Pour liquid mixture over the oat mixture and stir to fully coat. Spread the granola out in an even layer on the parchment paper-lined sheet pan. Bake for about 30 minutes. Stir a few times throughout baking. Be sure to keep an eye on it so that it does not burn or get too dark.